192 in stock Need More ? 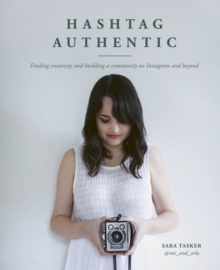 In Hashtag Authentic, social media guru Sara Tasker provides tips, advice and guidance on how to turn your personal Instagram account into a profitable creative outlet. Since setting up her Instagram account (me_and_orla) while on maternity leave in 2013, Sara has become a celebrated influencer and iPhoneographer, and through her calm, atmospheric and authentic style has garnered legions of followers. Here, Sara presents the lessons she has learned along the way. Sara's nurturing voice and enchanting photography provide guidance on:Storytelling, with tips on finding your own visual style and personal niche. Making pictures, including composing for Instagram, finding the best light and getting the most out of your camera phone. Archiving your life, with tips organized by themes like Craft & Making, Family & Pets and Food & Ingredients. Sharing your world, detailing the keys to Instagram success and beyond. Hashtag Authentic is both an inspiring manual and an interactive tool for finding an online voice, growing a tribe and becoming an influencer.